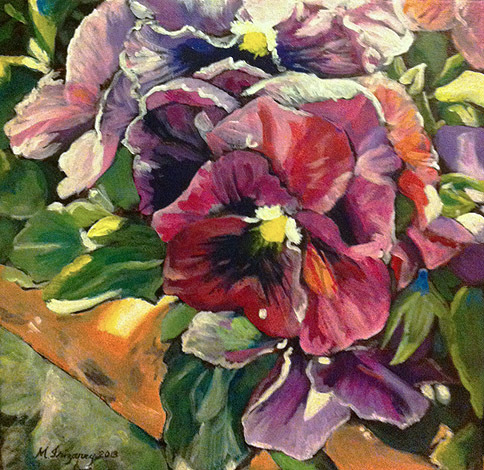 I've been into painting pansies lately motivated in part by the Florals/Botanical forum April 2013 challenge in the art website wetcanvas. Here are two in very different styles, both are acrylics on 12x12 inch gallery-wrapped canvas. The purple pansies with the lighter background (on the right) was painted in my usual style. I used saran wrap over acrylic paint in the bottom to get texture and the suggestion of leaves. I think that was successful. I just wish I had moved the pansies a little further down in the canvas. The maroon pansies (on the left) are a different style from my usual. I experimenting by starting with a black painted canvas and then building up the leaves and petals while leaving some of the black showing through. I like how rich the colors look against the black. In the future I want to use a similar technique but with reds for landscapes or alternatively, using local complementary underpaintings. Leave me a comment and let me know which style you like better.